I have very exciting news to share with all of my lovely readers. As of yesterday (or it may have been last week) Ichigo Shortcake’s restaurant reviews (and possibly even future recipes) will be regularly featured in the fabulous Melon Magazine which is a free Chinese magazine in Melbourne. Its purpose is to help Chinese speakers around Melbourne settle into this great city by offering tips and hints on where to eat, what to cook, current food and lifestyle trends and much more. Their issues are all online here if you’re interested and I am featured on pages 16-17 in the most recent issue – Issue 96. Melon Magazine is also available in print form and can be picked up from many locations across Melbourne for free (mainly at Chinese restaurants and grocery stores). Go to any of their magazines online and flip to the start of the issue to find out where you can get one. If someone asked me ‘are you a seafood or a meat kinda person?’ I would answer MEAT without a bit of hesitation and in a loud voice too. I’m not sure why this is. I’ve always loved my meats, whether it be poultry or red meats as I find them so tasty that I think I’d rather jump off a cliff than become a vegetarian. Nothing against vegetarians of course. So my point here is, I made steak the other day. “What do you want to have with your Dutch carrots side? Maybe cooked salmon?” Yuye asked me. “NO! I want steak.” I immediately replied. How did he not know that was coming? Yuye went out and bought 2 pieces of juicy good quality porterhouse steaks from our local butcher while I cleaned the kitchen, preparing for the feast that was about to arrive. This meal was a joint effort as I took care of the carrots and potatoes while Yuye cooked the steak. I must admit, Yuye is a way better cook than me. He used to do all the cooking and I all the preparing/assisting and washing up but recently as I started making things for the blog, he has just been laying back and watching (or rather just playing Diablo 3 – the game has really stolen my boyfriend!). 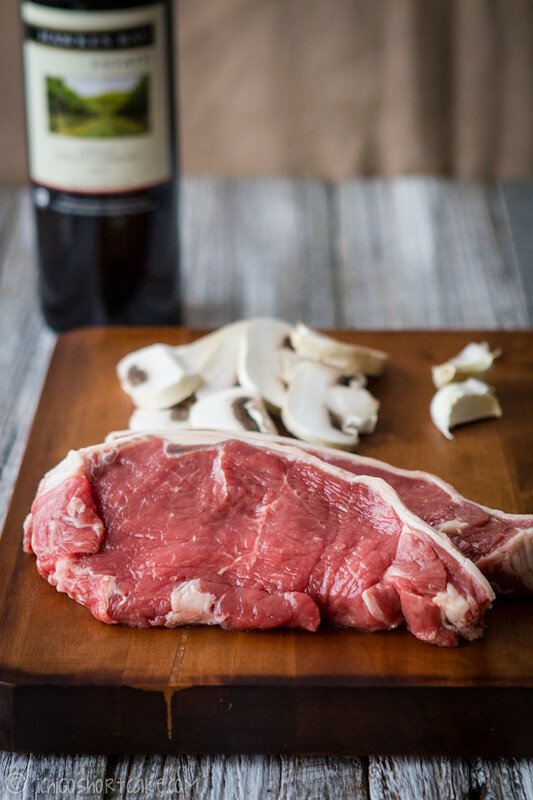 So this is Yuye’s recipe for how to cook a porterhouse steak to rare (just how I like it). Please note that he didn’t take the sinew and fatty bits off as he believes cutting them off once they’re cooked makes those side parts more tender and juicy and less likely to overcook, not to mention the fats will make the beef juices (and gravy) a lot more tasty. If you don’t like the idea of leaving them on, please feel free to cut them off when preparing. 1. Pre-heat oven to 200C (this can be done when you’re making the sides such as baby carrots and potatoes). 3. Oil and heat a flat pan to very high (almost smoking) and quickly put the steaks on the pan. 4. Move the steaks once or twice to ensure they don’t stick, leave on the heat for only roughly 2-3 minutes or until bottom side is golden brown. Turn the steaks over with tongs, careful not to squash the meat too much so as to retain the juices. 5. The second side only needs 1-2 minutes as it’s already partly cooked. Take off heat and put both steaks (stacked) on a piece of foil and wrap completely. Set aside. Make sure you don’t discard the remaining beef juices as this will be used for the gravy. 6. Put the steaks in the oven for roughly 5 minutes if you like them rare, longer if you like them more cooked. This step is to be done just before serving so make sure everything else on the plate is ready! 7. Salt and pepper as required and add the gravy. 1. Turn heat down to medium high and add a bit more cooking oil. Cook garlic until aromatic, then put sliced mushrooms on the pan and add flour, mixing thoroughly. Cook until the flour has turned a bit gluggy. 2. Add in red wine (which will deglaze the pan), beef stock and some water if it’s too salty. 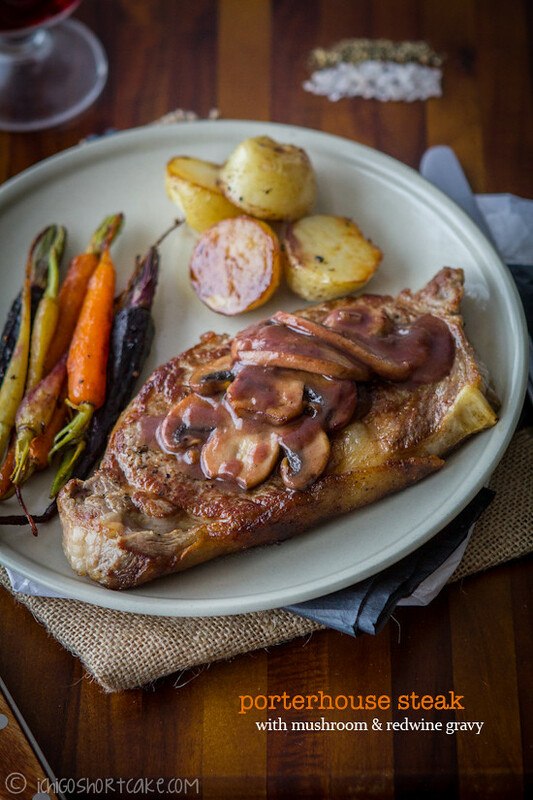 Cook until mushrooms are cooked through and the sauce is at the correct consistency that you like. I personally like mine not too runny. If you find the gravy is too thick, add a bit more water and beef stock. 3. Serve with the heated steaks. Note: The flour must be put in the pan after the mushrooms and before the red wine or beef stock as that’s the only way to make the sauce thick without making the flour lumpy. Question time: Are you a seafood or a meat kinda person? YAY! That’s so exciting! Congrats! I shall be looking out for your awesome reviews 🙂 I have to say I’m a HUGE seafood person. I think I could easily live without meat if I had seafood in my life. That’s such great news! Congrats on the new gig :D. Steak also looks yummy :). Congrats! This recipe, your photos and obvious foodie genius all prove that you’ll be perfect for this magazine job 🙂 WELL DONE! Congratulations on the new venture! They couldn’t have chosen anyone better suited for this! 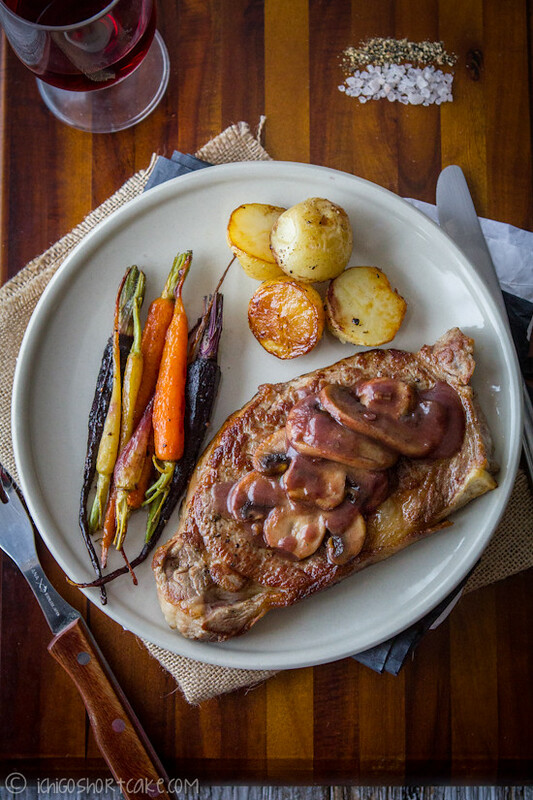 Love this steak – looks delicious! 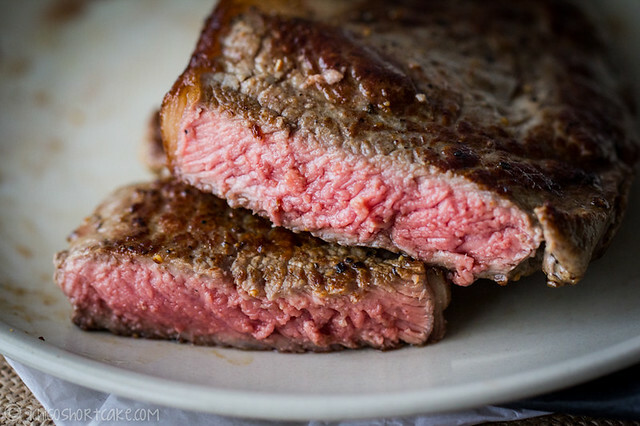 I love the look of the steak! My mouth was watering, it looked so tasty, and cooked exactly how I like it. Gorgeous photos. Congrats! And, superb looking steak! Congrats!!! I’m definitely a meat person, seafood is NOT my friend. Your steak is calling to me! omg i want that.. superb with a glass of red wine. Congrats on the great news! You’re terrific for this. And although I like seafood, a lot, if I had to choose, I’d be in the meat camp. Nice recipe – Yuye does it right. Thanks so much! 😀 Glad you think Yuye does it right since I know there’s heaps of ways to cook steaks! 😉 Woohoo go meat! Thanks Charles! Haha hope you end up making something great for tonight!